Catholic News World : What is 1st Friday Devotion to the Sacred Heart - Consecration to the #SacredHeart of Jesus - 1st Friday Promises and Instructions - Prayers - Share! What is 1st Friday Devotion to the Sacred Heart - Consecration to the #SacredHeart of Jesus - 1st Friday Promises and Instructions - Prayers - Share! PROMISES OF THE HEART OF JESUS FOR NINE FIRST FRIDAYS Devotion to His Sacred Heart involves the First Friday Devotion to the Sacred Heart of Jesus. This is based on a promise made by Our Lord Jesus Christ during an Apparition to St. Margaret Mary Alacoque. This promise was implicitly approved by the Church in the 1920 canonization of St. Margaret Mary. The promise reads: "I promise you in the excessive Mercy of My Heart that My all-powerful Love will grant to all those who communicate on the First Friday in nine consecutive months the Grace of Final Penitence; they shall not die in My disgrace nor without receiving the Sacraments; My Divine Heart shall be their safe refuge in this last moment." 1-Recieve without interruption Holy Communion for nine consecutive first Fridays. 2-Have the intention of honoring the Sacred Heart of Jesus persevering in our faith until the end. 3-Offer each Holy Communion as an act of expiation for the offenses committed against this Holy Sacrament. 4-Pray: "O Lord, who in the Heart of Your Son, wounded by our sins, has deposited infinite treasures of grace - we pray, that upon receiving the homage of our love, we have offered you a sufficient reparation. Through our Lord Jesus Christ. Amen. Heart of Jesus, I trust in You." 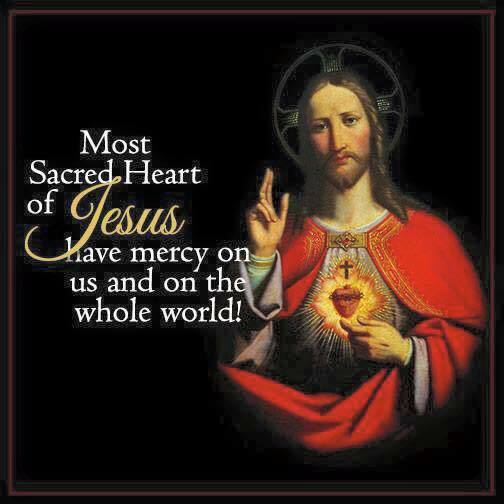 "O Sacred Heart of my Lord and Savior Jesus Christ, to Thee I consecrate and offer up my person and my life, my actions, trials and sufferings, that my entire being may henceforth only be employed in loving, honoring and glorifying Thee. This is my irrevocable will, to belong entirely to Thee, and to do all for Thy love, renouncing with my whole heart all that can displease Thee. "I take Thee, O Sacred Heart, for the sole object of my love, the protection of my life, the pledge of my salvation, the remedy of my frailty and inconstancy, the reparation for all the defects of my life, and my secure refuge at the hour of my death. . . I fear all from my own weakness and malice, but placing my entire confidence in Thee, O Heart of Love, I hope for all from Thine infinite goodness. Annihilate in me all that can displease or resist Thee. Imprint Thy pure love so deeply in my heart that I may never forget Thee or be separated from Thee. I beseech Thee, through Thine infinite goodness, grant that my name be engraved on Thy Heart for in this I place all my happiness and all my glory, to live and to die as one of Thy devoted servants. Amen. Our Father....Hail Mary....Glory Be to the Father....Sacred Heart of Jesus, I place all my trust in you. II. O my Jesus, you have said: "Truly I say to you, if you ask anything of the Father in my name, he will give it to you." Behold, in your name, I ask the Father for the grace of.......(here name your request) Our Father...Hail Mary....Glory Be To the Father....Sacred Heart of Jesus, I place all my trust in you. III. O my Jesus, you have said: "Truly I say to you, heaven and earth will pass away but my words will not pass away." Encouraged by your infallible words I now ask for the grace of.....(here name your request) Our Father....Hail Mary....Glory Be to the Father...Sacred Heart of Jesus, I place all my trust in you. V. Jesus, meek and humble of heart. Lord, have mercy. Almighty and eternal God, look upon the Heart of Thy most beloved Son and upon the praises and satisfaction which He offers Thee in the name of sinners; and to those who implore Thy mercy, in Thy great goodness, grant forgiveness in the name of the same Jesus Christ, Thy Son, who livest and reignest with Thee forever and ever. Amen.